So much is made about ergonomic office chairs these days, it’s tough to determine what adjustments you may or may not need. Having important ergonomics in the workplace is key to energy and productivity, but making a decision can be tough. Syncho-Tilt? Pneumatic Heights? With so many options out there buying the office chair can be a paralyzing decision. Let’s not complicate it… Take a peek at the 4 adjustments that we believe are the keys to ergonomic success. One of the most common adjustments is the most necessary. The height range of your seat should include heights both slightly higher and slightly lower than your ideal setting. Seated heights that range from 15”-22” will accommodate users from 5’0” to 6’4”. 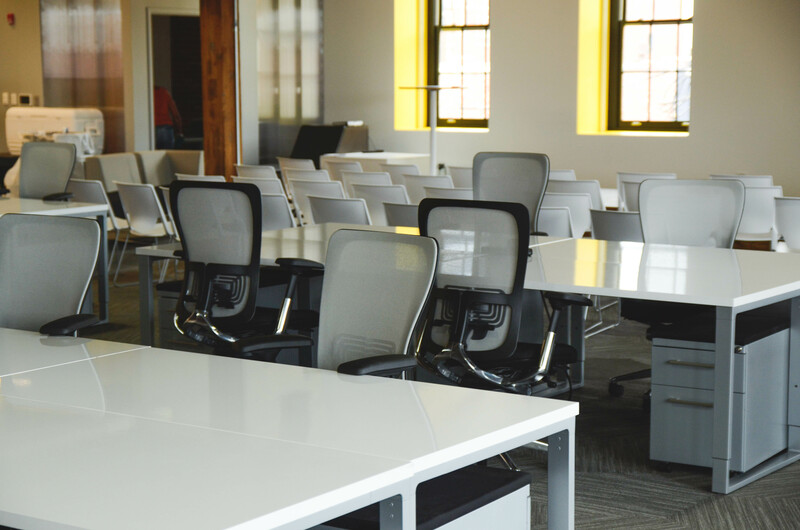 There are not many chairs that offer this large of a seat height range, so be sure to pay attention to this when considering an office chair. Once you have the chair, your knees should be at a comfortable 90 degrees when seated to maintain good posture. The lumbar support is an especially important feature if you have lower back pain or if multiple people will be utilizing the chair. The best lumbar supports offer both vertical and depth adjustments. If you are strictly looking for yourself, a fixed support depth lumbar support may be acceptable as long as the chair fits you and adjusts vertically. At the bare minimum, armrests should be height adjustable. At the ideal height, armrests should touch the bottom of your arm without straining to do so. At their lowest point they should be below thigh height so that they don’t impede your elbow movement when not needed. A pivoting arm is great as it will allow you to have supporting while completing tasks like writing or typing. My person favorite adjustment, the tilt controls. Being able to have a little recline in your seat in great, but for someone like me who is leaning forward constantly, it’s great having a chair that moves forward with me (The Herman Miller Aeron Chair). You can really play around with this adjustment depending on your unique seating style and the tasks you’re trying to accomplish. These features only scratch the surface of the adjustments that can come with ergonomic office chairs, but these are the core ones that every chair should have. To learn more about office chairs, how to shop, or how to maximize its use, give us a call at (614) 332-1828. We’d love to talk!